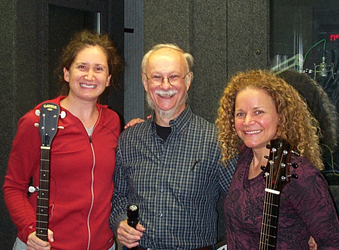 What a better way to spend a Friday night on Profiles in Folk than with two intelligent, vivacious and socially committed singer-songwriters who also happen to be two of Connecticut’s State Troubadours. Kristen Graves (left) is the reigning State Troubadour, while Lara Herscovitch (right) wore the laurels in 2009 and 2010, a reign which included an appearance on Garrison Keillor’s Prairie Home Companion. This was a return appearance to Profiles for both, but their first time together since they have recently been doing a bit of touring as “The Two Troubadours” and adapting their solo work to a duet format. Their music is remarkable but so is their commitment to social justice and social change. So, for a better part of this program we concentrated on that topic. Among many initiatives, Lara has long worked to better Connecticut’s juvenile justice system, while Kristen has been active in working with young people, especially on an Indian reservation, to aid them in reaching their potential through music. And thanks still once again to WSHU Chief Engineer Paul Litwinovich who mixed and recorded the sound and made sure we offered plenty of music for the two hours.